Brisket was a dish I became familiar with after I was married. My Sephardic mother never served this ultimate pot roast when I was growing up. I loved brisket the first time I tasted it. The juicy, melt in your mouth, savory-sweet meat is an easy dish to make for everything from Shabbat and holiday dinners to tailgate parties for the team. I reworked all the old recipes I had, and with the addition of dried porcini mushrooms, slowly caramelized onions, and red wine it is delicious. The leftovers make great beef au jus sandwiches. Peel the onions and slice into thin circles. Separate the onions into rings. Preheat a large sauté pan, add the olive oil, and add the onions. Stir the onions occasionally and season with salt and pepper. Once the onions are sizzling, turn the heat down to medium low, and let the onions slowly caramelize. They should be light golden brown and will have reduce down in volume a great deal. Stir occasionally. It will take about 40 minutes for the onions to reach the right color. Set the onions aside to cool. Place the brisket in a large roasting pan, fat side up. If you don’t have a large enough roasting pan, a doubled aluminum foil roasting pan works fine. Season the meat with salt and pepper. Pour the chili sauce over the brisket. Toss in the garlic cloves, sprinkle the brown sugar over the top, and distribute the sliced porcini mushrooms in the four corners of the roasting pan. Pour the red wine around the sides and in the corners of the roasting pan to moisten the porcini. 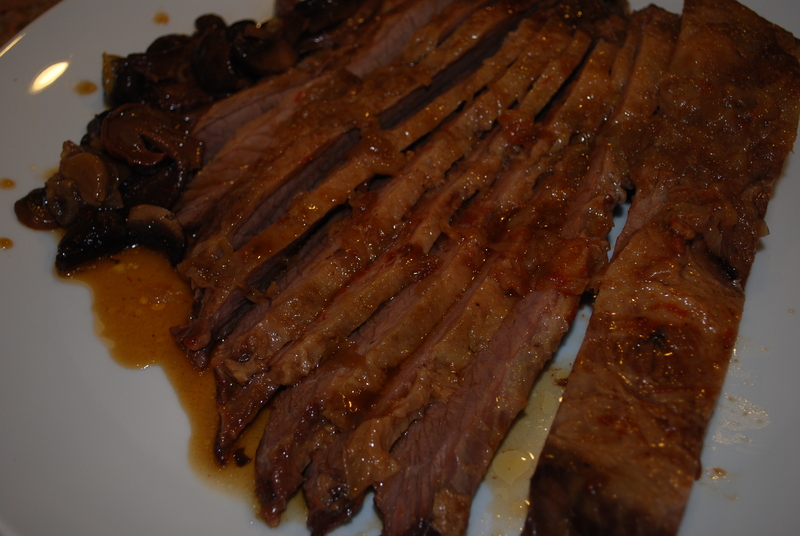 Spread the cooled caramelized onions on top of the brisket and lastly, toss in the quartered fresh mushrooms. Cover the roasting pan with a large piece of heavy duty foil or a tight fitting lid. Seal the edges well so no steam can escape during the cooking time. 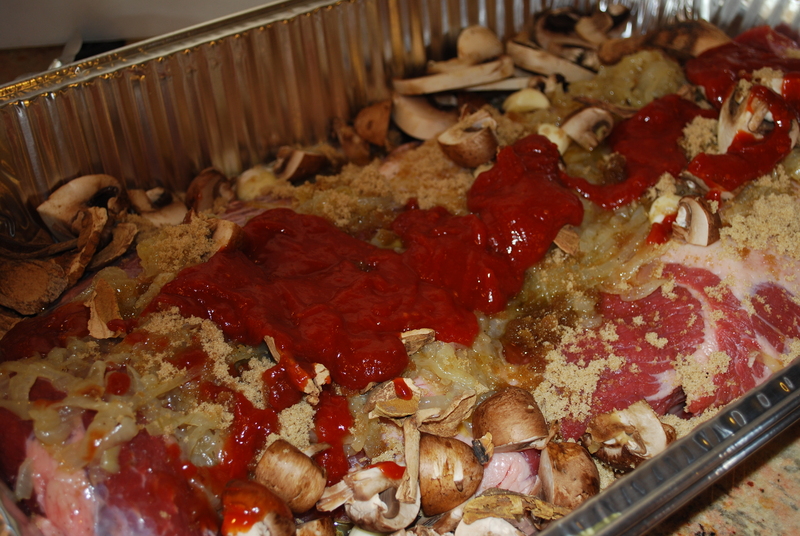 Preheat the oven to 350º and then place the brisket in the oven. Turn the heat down to 325º and cook the brisket for 3 to 3.5 hours until the brisket is very tender. No Peaking. Turn the oven off and let the brisket pan sit in the oven for another ½ hour. Carefully remove the pan from the oven without tipping because there will be a lot of juice. Let the brisket cool for another hour and then refrigerate. I refrigerate the brisket overnight and the next day before reheating, I skim the fat from the congealed juice. 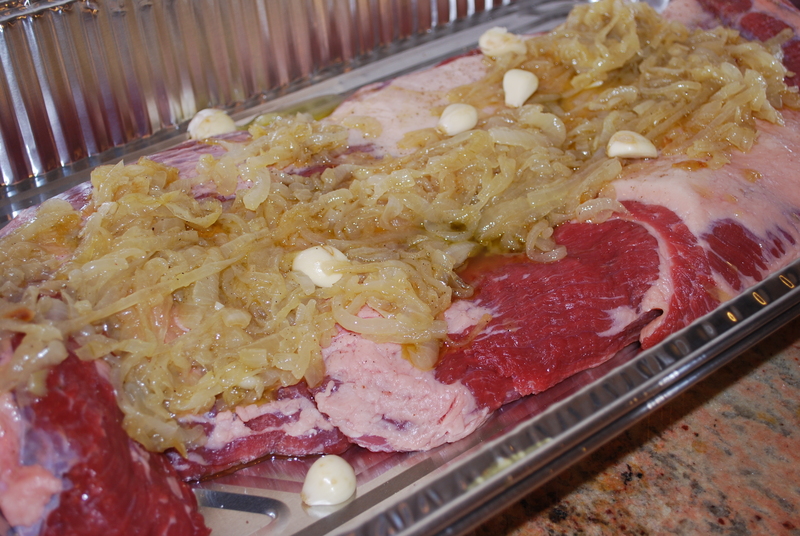 Next, wipe the onions from atop the brisket into the pan juices, remove the brisket from the roasting pan to a cutting board, and slice the meat across the grain into thin slices, each one with a little ribbon of fat across the top. 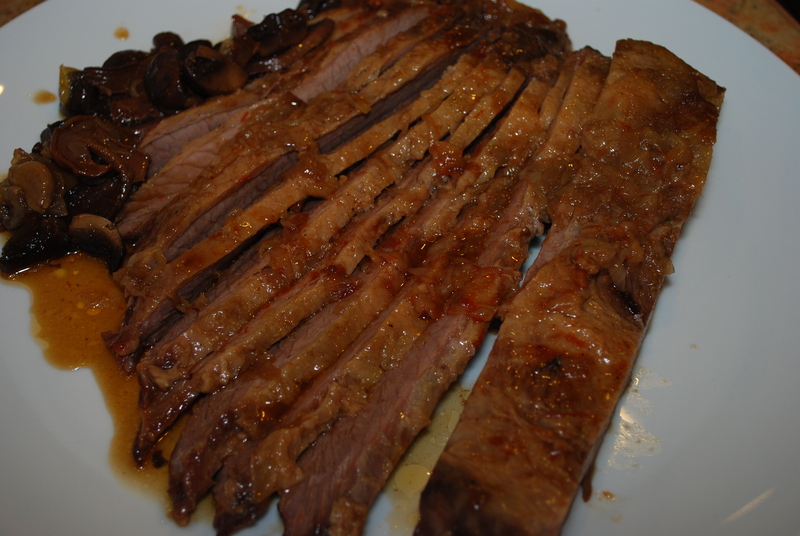 Before reheating, carefully place the sliced brisket back in the roasting pan juices in the order in which it was sliced. Spoon some pan juice over the top and cover tightly. The brisket reheats easily at 325ºoven for ½ hour. That brisket really sounds amazing. I learned a simplet brisket from my gramdmother. Just lots of onions, next to no added liquid, and then you cook boiled potatoes in the gravy that comes from the meat.